Before your baby was born, you probably had great plans for your maternity leave. Perhaps you were going to get the garden sorted, learn to speak Italian or take up knitting. Whatever it was, chances are you didn’t quite make it. And by not quite make it, I mean you didn’t even get round to ordering the language CD because you were so busy changing nappies, breastfeeding and trying to find clothes that didn’t have vomit on. Maternity leave is not quite the gap year you imagined, in fact it’s more like an intensive training course with no end in sight. Even the bare minimum is too much some days. Getting dressed is really making an effort, and managing to do laundry pretty much makes you a pro mama. Motherhood is all about lowering your expectations. Yes, laundry used to be a five-minute job, but now you should allow at least three days per load. Don’t hold yourself to your pre-parenthood standards, they’re simply unachievable now that you have a baby at home. During those newborn days, you don’t get anything done because you’re too exhausted/needed/napping. Your every waking moment is spent tending to the needs of your new baby. There isn’t much time for sleep, but you get by on what you can. Even having a shower becomes a mammoth task that involves leaving your baby for five minutes and checking on her 17 times in that period because the shower sounds a lot like crying. When showering is that difficult, how are you meant to find the time to fold laundry?! Pro mama tip: If you don’t do the laundry, there is nothing to fold. Win win. As your baby grows, you’ll encounter new challenges as you try to get things done. Your adorable baby, now crawling and evil, will undo every single thing you do all day long. She will unfold your laundry, hurl Tupperware across your kitchen and use crayons to draw across your freshly painted walls. She looks cute but she’s almost certainly doing it on purpose. By the end of the day, you’re exhausted. As you sit on the sofa, still wearing the pyjamas you awoke in this morning, you might look around the living room and wonder what you’ve been doing all day. Dirty laundry cascades down the stairs, toys are scattered across the living room floor and the television is covered in pasta handprints. You’ve been tidying and sorting and organising for hours, how are you not on top of it yet? Blogger Esther Anderson from Story Of This Life made a video that shows exactly why mamas aren’t getting anything done. The adorable video racked up over fifty million views in just 24 hours and has now been watched over 150 million times. The video clearly rang true to the mamas of the world. The short video managed to sum up perfectly the cuteness and frustration that mamas contend with each and every day. 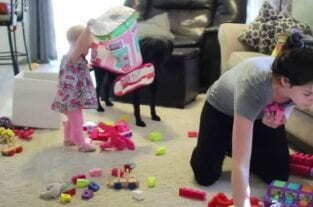 The video includes footage of Esther trying to get simple household chores done with her daughter, Ellia, in tow. This video will not disappoint. If you want to see another mama experience the frustration that is tidying a whole box of toys away only to hear it being tipped out moments later, you need to watch this video. If you’re sat in your own filthy house surrounded by toddler made mess, this video will help you out. Show it to each and every visitor before the entire your home, as proof that you did tidy up for their visit, even if it doesn’t look like it. Adorable Ellia will almost certainly remind you of your own baby, as she drags washing out of the dryer, clothes out of the drawers and toys out of their boxes. She’s so cute you can’t get mad, even though you want to because she’s rolling around in a pile of dirt on the floor. 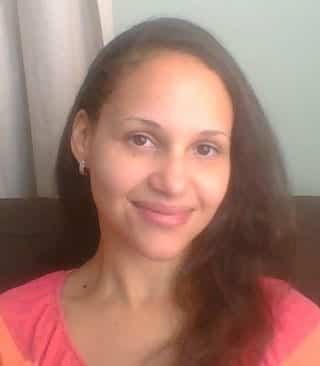 Esther showcases that loving patience that only mamas of young children possess. That sweet smile pleading the child not to blow a raspberry on the just cleaned window. And then the simple nod of recognition when the baby does just that, because of course. Highly recommended book: What Mothers Do, Especially When It Looks Like Nothing by Naomi Stadlen. Makes a great pressie for a new mama so she can relax and know the amazing things she’s really doing, even if she doesn’t feel like it. Love babies? You need more Babies Laughing Hysterically – 6 Must See Adorable Videos in your life. This made me laugh and cry all at once it’s so so true! !